Research on muscle fatigue has largely been confined to the muscle itself. That makes sense, where there is burn, there is fire. But motivation and will power turns out to have a greater impact on muscle fatigue than previously believed, according to a joint research project between the University of Zurich and ETH Zurich has shifted the focus to brain research. The researchers discovered neuronal processes for the first time that are responsible for reducing muscle activity during muscle-fatiguing exercise. The third and final part of this series of experiments, which was conducted by Lea Hilty as part of her doctoral thesis at the University of Zurich, has now been published in the European Journal of Neuroscience. Muscle's nerve impulses inhibit motoric area in the brain, they write. In the initial study, the researchers showed that nerve impulses from the muscle – much like pain information – inhibit the primary motoric area during a tiring, energy-demanding exercise. They were able to prove this using measurements in which study participants repeated thigh contractions until they could no longer attain the force required. If the same exercise was conducted under narcotization of the spinal chord (spinal anesthesia), thus interrupting the response from the muscle to the primary motoric area, the corresponding fatigue-related inhibition processes became significantly weaker than when the muscle information was intact. In a second step, using functional magnetic resonance imaging, the researchers were able to localize the brain regions that exhibit an increase in activity shortly before the interruption of a tiring, energy-demanding activity and are thus involved in signalizing the interruption: the thalamus and the insular cortex – both areas which analyze information that indicates a threat to the organism, such as pain or hunger. 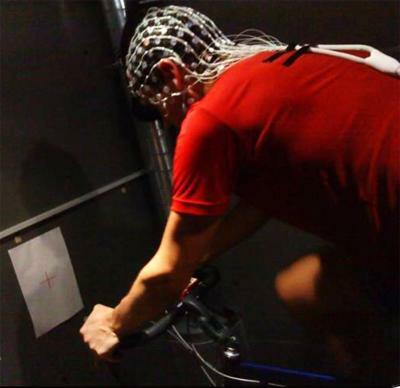 The third study has now shown that the inhibitory influences on motoric activity are actually mediated via the insular cortex: In tests using a bicycle ergometer, the researchers determined that the communication between the insular cortex and the primary motoric area became more intensive as the fatigue progressed. "This can be regarded as evidence that the neuronal system found not only informs the brain, but also actually has a regulating effect on motoric activity," says Hilty, summing up the current result. Fellow researcher Kai Lutz points to the new research field that now opens up with these results: "The findings are an important step in discovering the role the brain plays in muscle fatigue. Based on these studies, it won't just be possible to develop strategies to optimize muscular performance, but also specifically investigate reasons for reduced muscular performance in various diseases." Prolonged reduced physical performance is a symptom that is frequently observed in daily clinical practice. It can also appear as a side effect of certain medication. However, so-called chronic fatigue syndrome is often diagnosed without any apparent cause.